It’s been a painfully slow summer. The last time I blogged was 26-days ago when the S&P500 finished at 2,164. Today we find ourselves 12-points higher at 2,176. Holding nearly three-weeks of market risk netted owners an average of 0.02% profit per day. This year the market gapped lower 20-points or more at the open on multiple occasions. This means owners have been risking a 20-point loss for a measly 0.5-point per day gain. Over this period the potential downside has been at least forty-times the gain! All risk and almost no reward makes this a very poor time to be invested. Big money knows this and is why they have largely been absent as noted by the extremely low trading volumes. They haven’t been wasting their time on this mindless chop and neither should we. Stay in, stay out, but don’t try to trade this. While the market netted a measly 12-points, we witnessed far more intraday volatility. Ten, fifteen, twenty-point intraday moves and reversals have been common. 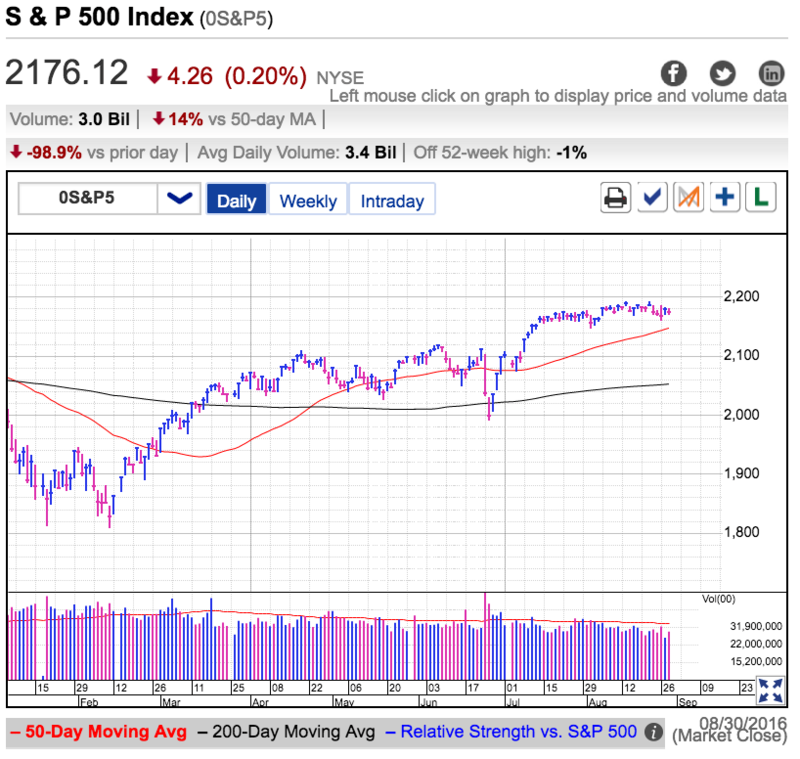 Even though the market gained 12-points over three-weeks, very few active traders made that much because they have been faked out by these phony breakouts and breakdowns. Trading mindless chop makes it way too tempting to buy high when things look good and sell low when second-thoughts creep in. That’s why I’ve been in cash for the last several weeks. The hardest thing for a trader to do is not trade, but that’s been the right call. But that was then and this is now. We are quickly approaching the market’s next directional move. Big money managers will return from summer vacation after Labor Day. With just a few months left in the year, they will start positioning their portfolios for year-end. That either means chasing these record highs even higher, or cashing in and taking profits. 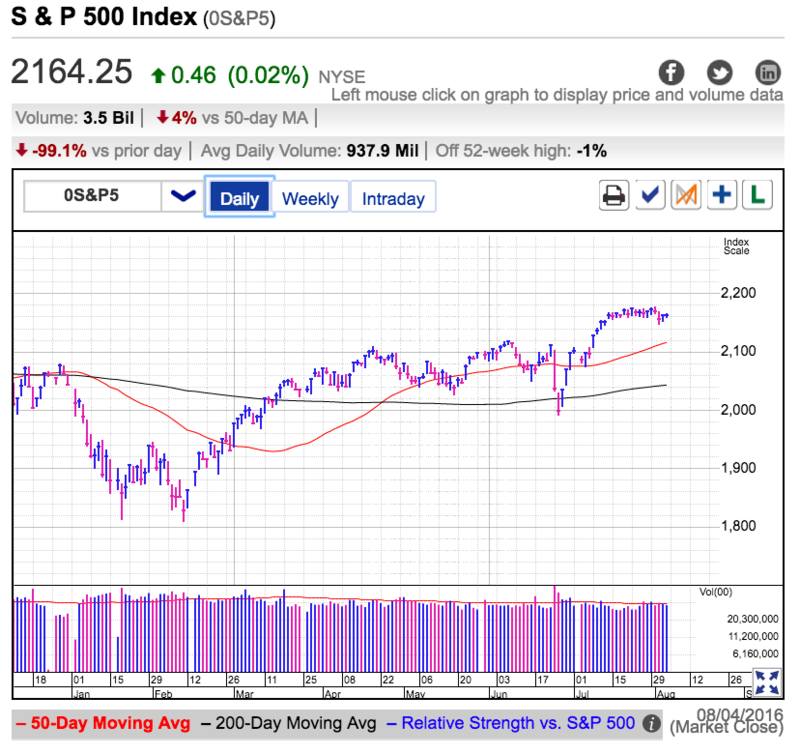 Since big money hasn’t been active the last several weeks, we don’t have enough information to discern if they are more inclined to chase, or alternately are in the mood to take profits. By mid-September we will have more data and a better indication of their intentions. Over the near-term, since the market has stubbornly held near record highs in the face of falling oil prices and the threat of rate-hikes, that shows most owners are confidently holding for higher prices. If we were over-bought and vulnerable, we would have fallen by now. That means the market wants to test the psychologically significant 2,200. Expect this slow, choppy grind higher to continue for the next couple of weeks. But what happens after that is anyone’s guess. That is when underweight big money will get desperate and start chasing prices higher. Or they will get cautious and start taking profits. The most likely outcome? Both! Four-months in the market is an eternity and plenty of time to have crisis in confidence, dip to 2,100 support, and rebound to all-time highs before year-end. Or maybe it happens the other way, desperate traders chase the 2,200 breakout up to 2,300 where we run out of demand and slip into year-end. The great thing about being a little fish is we are nimble enough that we can wait for more information. If the market does something unexpected, we can cash-in, evaluate, and adjust. While this mindless summer trade is putting us to sleep, this is the time to wake up and start looking for the next big trade because it is just around the corner.